On June 7, 2016, Speaker Paul Ryan released A Better Way: Our Vision for a Confident America, an agenda to address poverty in America put together by House Republicans’ Task Force on Poverty, Opportunity and Upward Mobility. 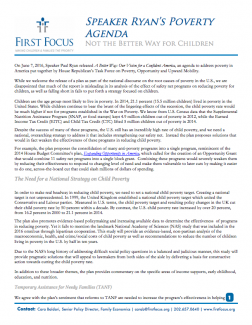 While First Focus welcomes the release of a plan as part of the national discourse on the root causes of poverty in the U.S., we are disappointed that much of the report is misleading in its analysis of the effect that safety net programs have on reducing poverty for children, as well as falling short to put forth a strategy focused on children. Read the First Focus fact sheet here. Share this analysis on Twitter.